“I am proud that we not only met but exceeded our Campaign 3SIXTY fundraising goal,” said Finn Wentworth, Campaign chairman, Foundation for Morristown Medical Center. The Foundation for Morristown Medical Center announced Tuesday evening that it had surpassed its Campaign 3SIXTY fundraising goal of $100 million by $6 million. The Campaign received over 22 gifts of $1 million or more, which will be distributed across 20 projects. 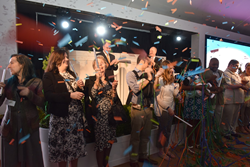 The final number was announced during a donor celebration event at Hartley Farms in Morristown, New Jersey. Campaign 3SIXTY began in November 2011. For more information, visit http://www.f4mmc.org/What-s-Needed/Campaign-3SIXTY.aspx. The Foundation for Morristown Medical Center is a nonprofit public foundation whose mission is to inspire community philanthropy to advance exceptional health care for patients at Morristown Medical Center. Its objective is to use philanthropy to preserve and expand the hospital’s programs and services in direct patient care, clinical research, medical and public health, education and preventative medicine. For more information, please call 973-593-2400 or visit http://www.f4mmc.org.